We all long for escapes at each point in life. From our regular office schedules, small breaks for the favorite coffee, timeout for a short outdoor game or a treat to the eyes with a new place. This is about an escape moment that would arouse the thirst of mountain lovers. Italy is a feeling of love for most of us with its Roma history, Venezia streets, Amalfi and Como. There is something there to excite every craving, whether its beaches, flashback to medieval times, lakeside gazing spots or even the best of cozy mountain huts. Being a fan of not so touristic places, I was in the quest for finding a place even more close to the nature and away from all city buzz. These days, once we decide a country, Instagram gives you tonnes of inputs from other crazy explorers, who would help you discover some of the untouched lands. 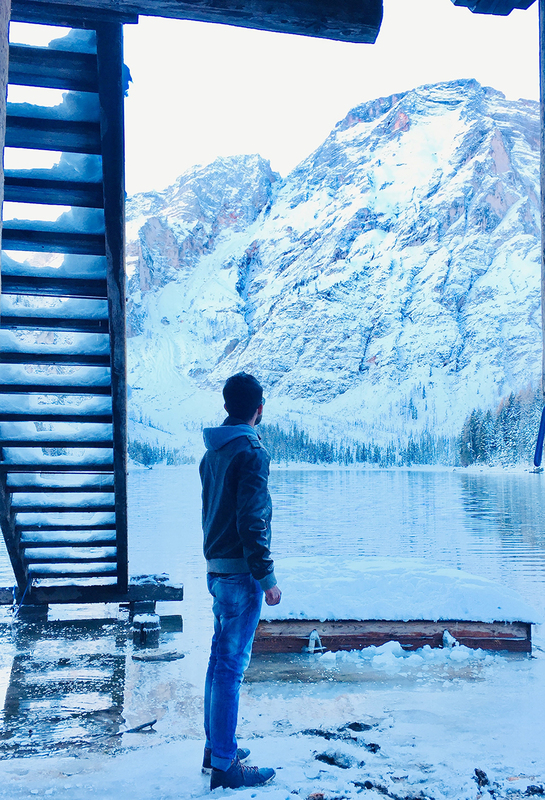 It was then I found, The Lago Di Braise in northern Italy home to mountain lovers, trekkers, campers, ones who likes to spend time outdoors close to the nature at high altitude, and get the freshest air away from all city buzz and noise. Its one of the not so touristic places in the country surrounded by the Great Dolomites (Italian Alps).Before I begin, let me show what it’s like to be on the road towards the Dolomites. Yes, these roads only boosted my thirst to explore this scenic place. Since it is surrounded by Dolomites, a lot of searches were about the point of interest within its 100 km radius. Some of the Youtube videos offered breathtaking aerial views of the route offering amazing autumn colors, snake shaped roads, breathtaking viewpoints and fresh air. After doing the research about the places to visit, I was clear that this would be my main destination in Italy. To top it up, Porsche also had a video on their page that showed one of their drive series through this scenic route. It gave all the more reasons to explore this piece of land behind the wheels. The Dolomites can be accessed through multiple routes, one from Venice and other from Milan. There are daily trains and buses from both cities. But this is a route for the ones who loves to take control of the wheels especially with hairpin bends, high altitude and more places to stop and enjoy the nature closely. We decided to drive from Venice and use the other route to reach Milan, so that both routes are covered. It’s about 3 hours of drive offering some amazing views during all seasons. This was during the first week of November this year, and snow filled roads was least expected. The journey began by an afternoon from Venice and I had absolutely no idea where to halt for the night. However, I was sure that the entire area would have plenty of breathtaking places to stay and relax. Setting Cortina d’ Ampezzo as the destination, we started the drive. Cortina is a nice town in the Dolomites area popular for its ski-resorts. The plan was that if it gets too dark and hard to drive, this could be the stop for the night, as Lago Di Braise is less than one hour from Cortina. 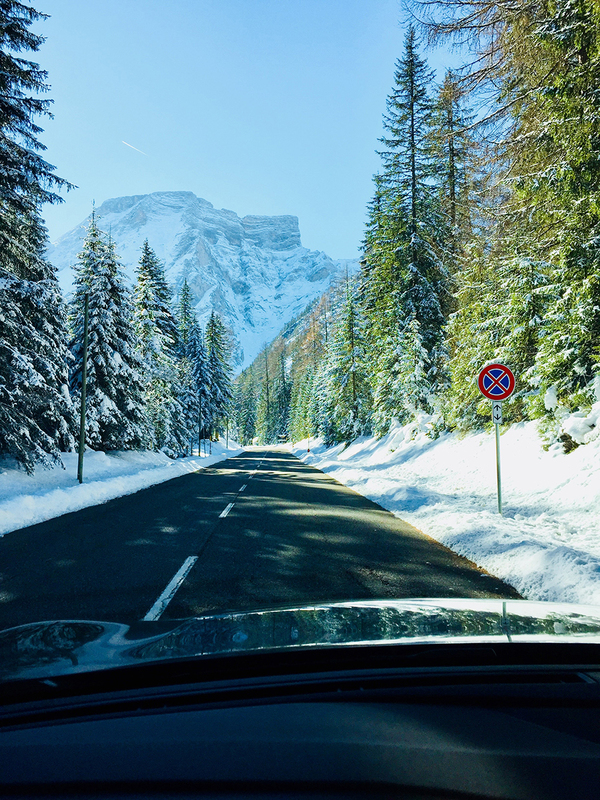 The route towards Cortina had well maintained motorway with tolls and many petrol stations to stop for a coffee break or fresh air. About thirty minutes after Venice, the great Dolomites started appearing from far-off with its snow kissed mountains and we realized, yes it was getting closer. By 5pm, we had reached Cortina and there was still a great level of energy to get closer to Lago Di Braise. This was mainly due to the snow filled scenes on both sides of road, mountains, curves and a fairytale feel. A quick search found for us a small cozy town called San Candido and an amazing hotel called Rosa. It was a lovely and clean hotel with a café that serves amazing coffee. Next morning, we bid goodbye to San Candido and moved closer to the main destination, Lago Di Braise. The route from the main road took us through a small road filled with snow on both the side and some amazing small huts in between. Yes, the picture below was one of it without any filters. Within about ten minutes, we discovered a parking lot filled with snow. Parking the car, we slowly walked into the small wooden gate that lead us to this amazing spot shown below. 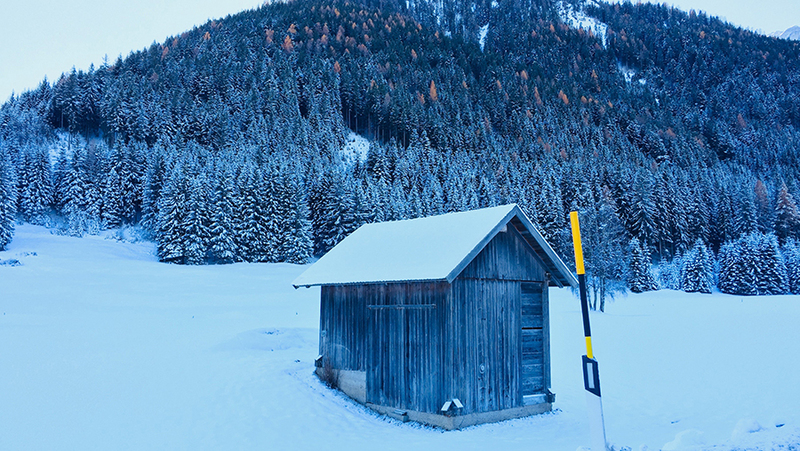 The small wooden hut facing the snow filled mountains is the best combination of visual treat we could ever ask. At this point, it’s absolutely moment of bliss at its peak. Hours and hours could be spent at this place for its fresh air, plenty of trees, mountains guarding you and most importantly a sense of total peace. The lake was partly frozen with all the walkways covered in ice. What activities does it offer? The Lago Di Braise is a delight for all seasons depending on your preference. The area has hiking routes that would interest the adventure freaks. We were surprised to see a group of adventurers aged about 50+ finishing their hike trail without worrying about the snow and the cold weather. The beautiful lake can also be explored with a canoe during the spring and summers, however it’s a tough call during winters unless you want to fix ski gear underneath. The lakeside also has a nice cozy restaurant offering some great Italian dishes including delicious tiramisu, mouthwatering coffees and good wines.